Hindwing with 1 long and 1 short tail. 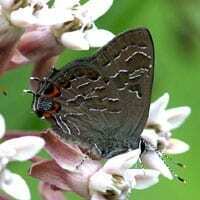 Upperside dark brown; male with a long, oval spot along forewing costa. Underside of both wings with rows of widely separated white stripes; blue spot near tails topped with orange. Outer margin of hindwing indented above short tail.